Displaying HTML can be achieved by setting the HtmlSource property of RadHtmlPlaceholder. 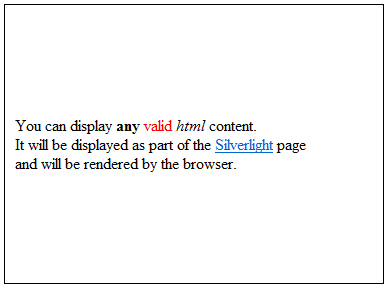 Any valid HTML content will be displayed as part of the Silverlight page layout and will be rendered by the browser. <i>html</i> content.<br/>It will be displayed as part of the <a href=""http://silverlight.net""
RadHtmlPlaceholder1.HtmlSource = "You can display <b>any</b> <span style=""color:#FF0000;"">valid</span> "
Silverlight</a> page<br/> and will be rendered by the browser."